Wondering how to use this camera? 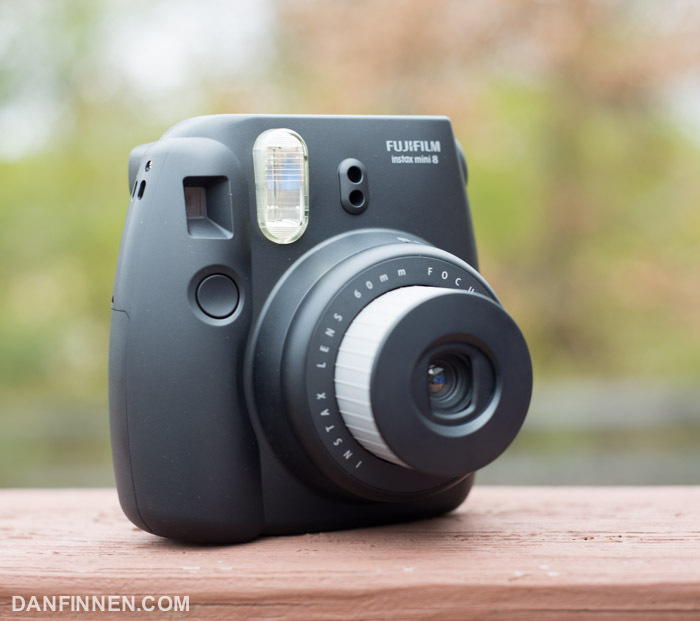 Check out my Beginner’s Guide to Using the Fuji Instax 8! Update Spring 2017: Fujifilm is releasing the Fuji Instax Mini 9, which is nearly exactly the same camera as the 8, just with a new number, a miniscule ‘selfie mirror,’ and a close-up mode. You can check out the full review here. Update 2014: Fuji has released a new camera, the Fuji Instax Mini 90, which is a more expensive version of this camera that handles a bit nicer and looks way, way better. If you’re in the market for an Instax camera, I recommend checking it out! The Fuji Instax Mini 8 is one of the newest instant cameras that Fuji has released and uses Fuji’s tiny Instax Mini film. If you haven’t used or seen Instax Mini film before, be prepared, it’s every bit wallet size. It’s exactly 1/2 the size of traditional Instax film, and uses the exact same chemicals. I wasn’t sure what to expect with the Instax Mini 8 since I wasn’t a huge fan of the Instax 210, but I ended up finding a lot to like in a small, durable package. With a few caveats, it’s a great camera for use in events and weddings. However, because of the limitations of the Instax Mini format itself, I wouldn’t recommend it for photographers looking for detailed images. The layout of the Instax Mini 8 camera is quite different from every other instant film camera I’ve used out there. Generally, Polaroid and Fuji cameras have a flash on/off, a shutter, and not much else. This camera has no flash on/off (which is a pain), but strangely enough, it has multiple manual exposure options. This is great for those who want exact control of the picture, but since flash nearly always fires there’s a limit to how much you can actually control exposure. To use the camera, press the switch next to the lens, which pops the lens out. Once the lens is out, you can adjust the manual exposure slider and take a photo. To turn the camera back off, just mash the lens back in. It takes some getting used to, but in practice it works fairly well. One of the stranger aspects of the camera is the decision to place the viewfinder on the top right edge of the camera, the exact opposite side of nearly every other camera on the planet. Every other Fuji camera I’ve used, including the Quicksnap, all have their viewfinder on the left side or center. I missed numerous shots with this camera as muscle memory led me to place my eye on the left side of the camera, leaving me hunting around trying to find it on the right. If you rotate the camera 90 degrees counterclockwise, the viewfinder moves to the correct place, but you’re forced into shooting in landscape mode. The Instax Mini 8 has a 60mm wide angle lens with a fixed focus range of .6 meters to infinity. I found the lens to be quite sharp, but close up objects will be noticeably out of focus. The focal length of the lens is just wide enough to easily frame up people in tight environments, but isn’t so wide as to introduce distortion. Speaking of distortion, there is very little to speak of. Even if you take a photo of a brick wall (like I did), distortion is relatively subtle and there appears to be no noticeable falloff in sharpness on the edge of the frame. On the Instax 8 exposure is manually set with a ring on top of the lens. Almost without exception, instant film cameras all have automatic exposure. That is, all of them except for the Fuji Instax Mini 8. Instead of just picking the right exposure for you, the camera highlights one of four suggested exposure levels it thinks you should use. It’s not hard to do, but it feels like it adds an unnecessary step to what is typically a beautifully simplistic affair. Instant film cameras should be immediately usable for anybody picking it up for the first time, but this exposure system adds in a wrinkle that could confuse some people (like a grandma at a wedding). Since the camera has exposure detection already built in, it’s strange that they designed this camera this way. Otherwise, exposure seems reasonably accurate. I found it tended to underexpose slightly when outside, but indoor flash seems to work just fine as long as you’re close to your subject. 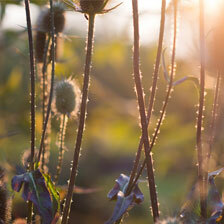 If you want to blow out your subject for some reason, Fuji helpfully includes a ‘high key’ option. 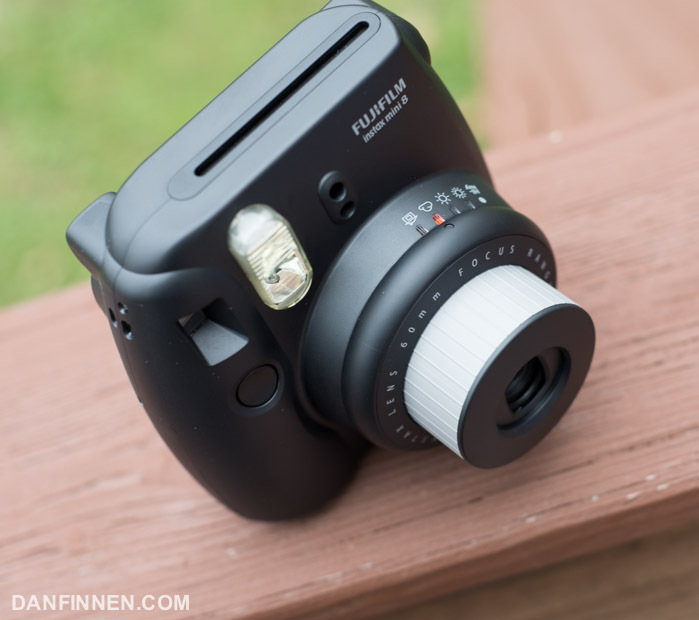 The Instax Mini 8 is quite small for an instant film camera. Unlike the beastly Instax 210, the camera can fit comfortably into a backpack or large coat pocket. It takes up a hair less space than a small SX-70 era Polaroid camera. Those who are used to tiny digital cameras or iPhones will probably find it quite large. 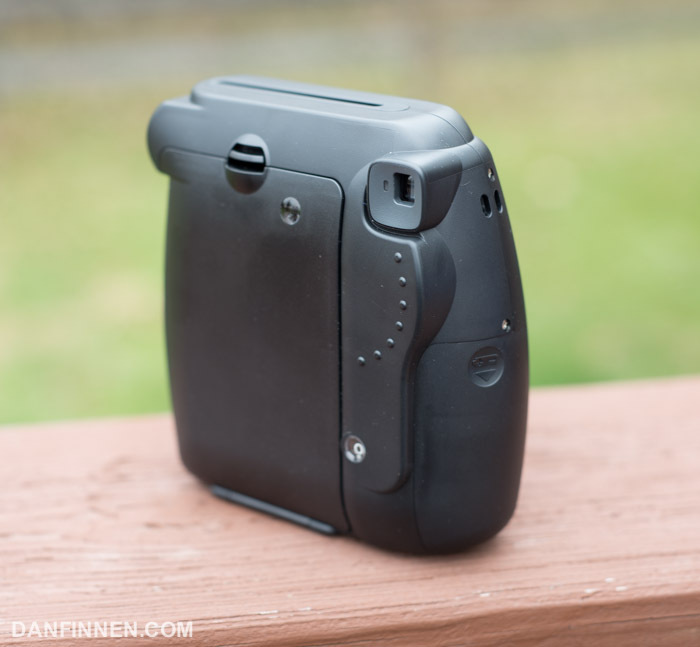 The camera runs off of two AA batteries that sit in the grip, much like the larger 210. However, unlike the 210, the battery door actually closes properly. Even though this camera is an all plastic affair, it feels solid and durable. Non-torx screws hold the whole thing together, which leads me to think that the camera is easy to open and repair. If candy colors are your thing, this camera comes in a variety of pastel colors. The black looks professional and understated, so I personally wouldn’t pick up any of the other colors. The Fuji Instax Mini 8 is a perfectly competent, well-built camera that does exactly what it needs to do. I recommend using Fuji Instax Mini film for weddings, events, and parties, as the film is relatively affordable and the images will last many years. The release of Instax Mini Monochrome film in 2017 also gives the Mini 8 even more versatility with a black and white option. For advanced photographers, I recommend getting a used Polaroid camera and some Impossible Project film, but if you want a relatively cheap and fun way to get started in the instant film world the Fuji Instax Mini 8 is a great place to start. The Fuji Instax world of cameras and film is blowing up, so if you’re wondering where to start, I recommend checking out my guide to buying Fuji Instax cameras to see what your options are. Good luck and happy shooting! 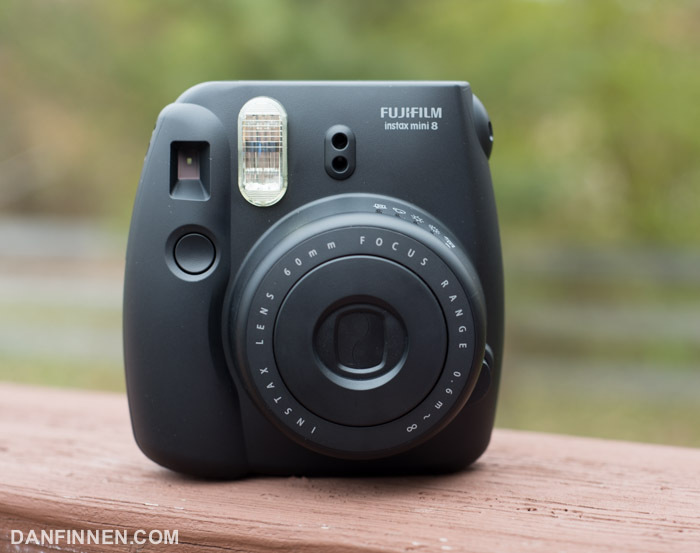 Get the Fuji Instax Mini 8 on Amazon. Using these affiliate links costs you nothing and helps me keep this site online. Thanks! If you pick up one of these cameras and are wondering how to use it, check out my guide to getting started with the Instax Mini 8. Interested in getting articles about Fuji Instax and Polaroid instant film sent to your mailbox every month? Sign up for my newsletter!